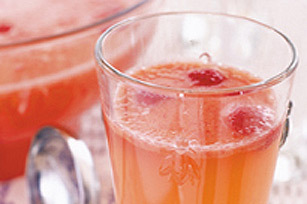 Whip up a batch of this frosty punch for your next warm-weather get-together. Raspberry sherbet transforms this beverage into a party-worthy punch. Mix first 3 ingredients in punch bowl until drink mix is dissolved. Prepare using Crystal Light Pink Lemonade Low Calorie Drink Mix. Recipe can easily be cut in half. Prepare as directed, cutting all ingredients in half. Whip up this cool, refreshing punch on a hot summer day and discover how it can be part of a healthful eating plan.